All off-airfield landing sites in Helipaddy require prior permission (“PPR”) before you can land, no different from aerodromes and actually much more important. We have introduced a new checkbox that lets pilots know which non-aerodrome sites you can (almost) fly straight into with minimal prior permission. Helipaddy encourages - where possible - landing site owners to avoid “notice creep” (pointlessly long notice periods). We now identify these non-aerodrome sites that allow short PPR notice with a tick in the “Short notice” box. At the owner’s choice, we will now be able to identify the landing sites that are the easiest to visit. We don’t want to penalise pubs or B&Bs with animals that might need a day to move them. However, we hear a lot from our members “where can I go this afternoon”? The “Short notice” box will identify sites where the minimum PPR notice is required, typically just before departure. The equivalent for aerodromes is ‘PPR by radio on approach’. If you need prior permission other than a radio conversation with ATC, this box should remain unchecked. 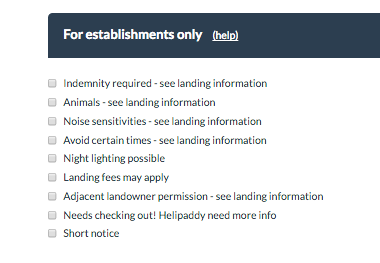 Airfields without an ICAO code are classed as ‘landing sites’, not aerodromes, in Helipaddy and so should tick the ‘Short notice’ box if it applies. Please remember that there is no such thing as a private landing site with “no PPR” - all landing sites are PPR.